Sorry I haven't updated this in a minute, but the last couple months have been an absolute ride of traveling and work, and this blog fell by the wayside for a bit. That said, I'm gonna spill all of that good bansheebeat news right here so we can get caught up together! We've got a lot to go over (it's been a busy summer! ), so let's get started! I dropped a slew of new things this summer, from a handful of remixes, as well as a new EP! In addition, I decided to move all of my Soundcloud exclusive releases over to Bandcamp as well, and am currently working to further push the rest of my discography onto my Spotify and Youtube pages! Here is my remix for rapper ehiorobo's "Heir to the Sugar Honey Queen" off of his Limeade release! This remix was a lot of fun to do, since I did a lot more with hip hop beat influences than what usually shows up in my material. Guys like Madlib, DOOM, and J Dilla have been some of my favorite producers to listen to over the last ten years, so it was really nice to finally return the nod in this capacity! I also got to get a little more sample heavy than I usually do, something I definitely want to bring out a little more in future releases! Check out the remix, and grab a free download over on my Bandcamp! Following our appearance at C-Reader in Little Tokyo a few weeks back during Anime Expo, they asked me to appear on their upcoming remix EP, featuring remixes from matra magic, SOTUI, The Hair Kid, and Shadrew! When I first approached the track, "Cotillion," I was somewhat at a loss for how to approach it. Coming off of my recent bouts with a more club friendly sound, I found it difficult to frame the original song in that context. However, I realized I could do a lot more and have a lot more fun taking the track and fitting it in a more VGM setting. Taking cues from soundtracks like Yoshi's Island, I zoomed through the creative process and ended up with a near finished product in just two days! The final track ended up taking a lot of accidental cues from Toby Fox, but I'm not complaining! The track was really fun way to take a side step from what I've been working on, and work with having more adventurous and wacky harmony than what I usually do (there are a lot of key modulations and chromatic chords that really spice up the track). Check out the track, and grab the full Keychain Remixes release here! Back in 2014, I released a handful of tracks inspired by the disco and funk fueled vaporwave scene that was exploding at the time. These tracks, accidentally playing into a popular trend at the time, blew up to an astounding degree, and the exposure of just a handful of songs quickly eclipsed the rest of my output, despite having a cultivated sound and following at the time. With these unpolished, made-for-fun tracks becoming the thing I was beginning to be associated with the most, I took them down and worked to reestablish myself outside of that sound and style, which was beginning to garner criticism for widely revolving around a visual aesthetic heavily associated with misogynistic and culturally insensitive imagery. I held onto those tracks for years, only sharing them along with the rest of my b-side catalog as a reward for supporting my Patreon campaign. When I made the decision to move my entire discography to my Bandcamp page, I decided that after three years of hiding them under a rock that I should finally release them publicly! So, for the first time in years, please enjoy these fun little summer jams, which you can grab for free over on my Bandcamp! Back in July, I was incredibly lucky to fly out to Los Angeles, California to perform two shows during Anime Expo 2017! The first was an official AX showcase, put on by the label behind the "Techo Deluxe" release, Attack the Music! Playing alongside some of my favorite artists like Ujico*/Snail's House, Mitomoro, hikeii, and more, it was an absolutely charged lineup. That, combined with the fact that I was performing on Pioneer CDJs for the first time in my life (and I pulled it off somehow! ), kind of made for an absolutely unforgettable evening! The following night, alongside friends like Slime Girls, kiraku, and a surprise guest appearance from m-flo's Taku Takahashi, we tore up Tokyo Beat in Little Tokyo for the C-Reader showcase! While much more intimate of a setting than the ballroom we played in at Los Angeles Convention Center, the night was by no means any less intense! Both shows were absolutely thrilling, and I can't wait to perform more in the near future! For the first time ever, bansheebeat merchandise is available via my Bandcamp store! Boasting everything from stickers, CDs, pins, and prints, I have a wide selection of stuff for sale! All purchases go toward the production of new merchandise (shirts, keychains, and koozies are currently in the works! ), so please go take a look and consider picking something up!! I currently cooking up a bunch of new stuff that I'm looking to drop over the next few months, so keep an eye out for brand new original tracks, remixes, releases, mixes, and videos! If you like what I do, consider picking up some merchandise or supporting my Patreon, or if you'd rather support me for free, follow me on Spotify, Soundcloud, or Youtube, and share my releases with your friends and family, and tell people about this blog! Being an independent musician is kind of a trip, so I enjoy sharing my experiences with others! Now that the summer is over, I plan on keeping this page updated on a much more regular basis, and might even post some exclusive reflections, insights and news, so stay tuned! Once again, thanks for coming along with me, and I hope you'll join me in seeing what the rest of 2017 has in store! Today is the final day of our Spring bansheebeat release project! Thank you for joining me on this journey for the last several months! Over the course of this project, I've learned so much about working, promoting, and branding as an independent musician, and I hope you've learned something as well! While we say goodbye today, I hope you will join me for similar experiences in the future; there is still so much to learn and experience and I hope you'll continue carrying on with me! I've mapped out this final update into a cohesive look back at the last eight weeks, covering my experiences with an finalized introduction to the project, a final look at the results, a timetable, and lastly a reflection to share my thoughts. We have a lot to cover, so let's get started! In my experience, I’ve seen that independent musicians struggle to find new ways to differentiate themselves in today’s over-saturated market. Combined with the fact that more musicians are out promoting their material than ever, and that consumer tastes have changed to reflect more regular and digestible forms of content, working as an independent musician today is a struggle very different to any time before. Thus, I set out to discover ways to regularly promote yourself as a content creator, a brand, and an artist. As someone who rarely held any interest in matters relating to “audience outreach” and “personal branding,” I never really gave these things much thought in the past. However, as I labored to elevate myself more and more as a working professional, these topics came more and more to the forefront of my attention. Considering my inexperience with these concepts, I decided that myself as an artist would benefit most from researching these ideas and learning how they affect and drive professional growth. Upon choosing my topic, I realized that I was surely not the only independent artist struggling with these issues, and set forth to record my findings, log my experiments, and pen my overall experiences so that others in a similar position could possibly learn and benefit from my experiences. When it comes to succeeding as an independent musician, most of the work regarding advertising, promotion, visibility, and marketing lie solely on the shoulders of the individual, so I set forth to discover how to manage exactly how to successfully implement these notions into my work. My project's goals were to research independent promotion, marketing, and branding strategies, collaborate with a professional record label, and curate multimedia promotional materials to maximize visibility for my new release. When I began to organize this project, I decided that the best way to tackle it would be to shape it around the release of my then-unreleased album. With this basic groundwork in mind, I set forth to curate the remainder of the project’s objectives to frame this basic strategy. Dividing it by weekly goals, the initial plan for the project was to work toward bigger milestones while accomplishing smaller achievements that all worked into the plan at large. My initial guidelines were to research independent promotion, marketing, and branding strategies, create regular multimedia content to increase visibility leading up to the release, team up with a record label to maximize outreach for the final release, organize merchandise to coincide with the release, set up multiple promotional events to increase awareness and following that with additional public appearances and performance opportunities, and to refine branding and promotional materials to reflect a singular mission. While the project did not go 100% according to my initial blueprints, I accomplished much of what I set forth to complete and managed to oversee a successful digital release. This project was honestly much more work than I had ever anticipated, but in being so was much more personally satisfying. While things like promotion and advertising can be a taboo subject for independent artists, it was really rewarding to start taking these ideas into my own hands. While these concepts can be somewhat uncomfortable, like when considering the business aspect more than the artistic side, it’s integral for independent musicians to function in a professional setting. This project was some of the first times that I’d put actual energy and work into promoting myself, and in doing so felt like a professional musician for the first time. Not only that, but mapping out plans and goals for yourself that weren’t strictly musical in a sense led me to accomplish all sorts of new and exciting things! For example, it was the first time I’d worked with a professional record label, and I’m already seeing new opportunities open for me. While that aspect wasn’t entirely perfect (working with a label partly based in Japan led to some streaming issues facing international monetization, especially with Soundcloud), it was an exciting new experience that has me excited to collaborate with more people in a similar setting in the future! Also, I booked and organized multiple events, and created my own artwork for things, neither of which I’d never done on my own before. In finishing this project, I feel less like a single-minded musician and more like a well-rounded individual, capable of handling multiple aspects of maintaining myself as an artist. While I still have so much to accomplish and learn, so much of this prepared me for the future in ways I did not expect whatsoever! While many properties of personal promotion, brand development, and marketing still very much elude me, I feel like I’m well on my way to discovering how to live and work as a professional independent musician in today’s global musical environment! This week in our bansheebeat Spring project coverage, we’re entering week two of the post-release season, and I’m not getting any less busy. Following the release of my new EP, "Techo Deluxe," last week, I’ve been hard at work doing my best to promote it. While promotion is a concept that still very much eludes me, I’m doing my best to make the release as visible as possible. On top of doing everything I can to get the release in as many ears as I possibly can, I have a multitude of new things I’m working on to prepare for the summer. On top of things like new merchandise, I’m beginning work on a music video to support the album, as well as trying to work out performing opportunities over the summer. While things like new material and current musical projects (be it commissions, remixes, or what else have you) are still in progress and on the brain, for the purposes of this project I’m mainly focusing on non-musical endeavors, as those are predominantly the things I have little or no experience with. So, with that, let’s get started. This has been an incredibly taxing week between work, classes, bansheebeat stuff, and everything else, so I’ve been doing my best to find time and energy to push the new EP more and more into the public eye as I can. While I’ve been exploring social media outreach and a little in paid advertising via Facebook and Instagram, the main other avenue I’ve been looking into is publication coverage. Currently, I feel that the world of music journalism is primarily made up of a series of tastemakers left over from the independent music blog bubble of the early 2010’s. Many independent music publications folded over the last several years, and those that are left have gained larger reputations in staying afloat by gaining larger audiences and are financially stabilized through advertising. As such, the remaining music journalists of this era remain struggling to navigate an over-saturated musical landscape, and as such rely on the coverage of already established musical acts. Due to this, it’s somewhat difficult for a lesser-known artist such as myself to appeal to these larger publications. That said, I’m currently doing my best to get in touch with as many publications as I can, even if it results in “cold-emailing” and a shot in the dark. So far, I’ve managed to successfully contact a handful of smaller publications, such as Japan’s “MakeBelieveMelodies” and “NEST HQ” for potential interest in coverage. In addition, the student publication “The Daily Wildcat” of the University of Arizona (where I am currently a student) has expressed interest in conducting a possible interview to discuss the release. Aside from these, I’m working to acquire as much coverage as possible, but we’ll have to wait and see how successful this course of action ends up being. In addition to the Internet radio stream event I discussed last week, I organized a local show here in Tucson to really celebrate the release in a physical space. Joined by local Tucson act bbgar and Phoenix electronic chameleon C Clark, we ushered in a fun concert at Tucson’s local Pomoro venue. While I’ve mostly had poor luck with hosting shows in Tucson, whether it be unfortunate experiences regarding shady venues, detestable “pay-to-play” policies, or any other number of uncomfortable scenarios, our show was hosted in an incredibly relaxed environment, with everyone in attendance having had a worthwhile time. Because of this wildly different experience, I’m becoming more interested in performing locally on a much more regular basis. Ah yes, I’m finally planning out new bansheebeat merchandise for the summer of 2017! However, this comes with its own set of challenges and obstacles, especially in my personal experience. One of the largest requirements for creating merchandise is, well, the capital to cover the initial investment. As a full-time music student, I currently don’t have the ability to work more than I currently do, and I unfortunately only make enough income to cover personal necessities, so things like producing merchandise are very seldom a priority or even a feasible undertaking. To overcome this, I began a Patreon campaign in the beginning of 2016 to help in covering various artist expenses. While my Patreon is unbelievably helpful, it unfortunately only covers a handful of my personal artist expenses at the moment, so using those additional resources for something like merchandise isn’t possible at the moment. So, because of this obstacle, it’s incredibly pertinent that the budgeting and financially organization work I put into it ahead of time is absolutely rock-solid. I plan on collaborating with close personal friend Michael Gee, who on top of accounting experience has worked with several companies on tax and budgetary matters. Please look forward to more information on merchandise plans next week! Some of the things I have planned are "Techo Deluxe" CDs, tapes, new stickers, as well as possibly USB drives. I’d like to also have a shirt design ready in the next several months, but alas, shirts are one of the priciest pieces of merchandise to produce, so we’ll have to see how likely that is down the line. I’m currently working on summer plans for a new release series. Whether it’s remixes or new singles, I want to have a stream of new content over the summer to continue the PR boost that’s started from the album release. In addition, I’m looking to organize a small tour! Unlike most of my independent musician friends, I’ve never toured, and thus have absolutely no experience in coordinating that sort of thing. Also, I was just asked to perform in Kansas City over the summer, but I have to see whether or not it conflicts with a work commitment. That’s about all of the news I have for this week. I still have so much work to do, on top of musical theater work and the end of the academic year weighing down on me, but I’m going to do my best to accomplish as much as I can from here on out! Please look forward to joining me in wrapping the project up for the next few weeks, and I want to thank you for accompanying me on this adventure! See you next week!! I’ve got some big news this week! We’re now past the halfway point for my spring bansheebeat release project, and finally everything is fully coming together! 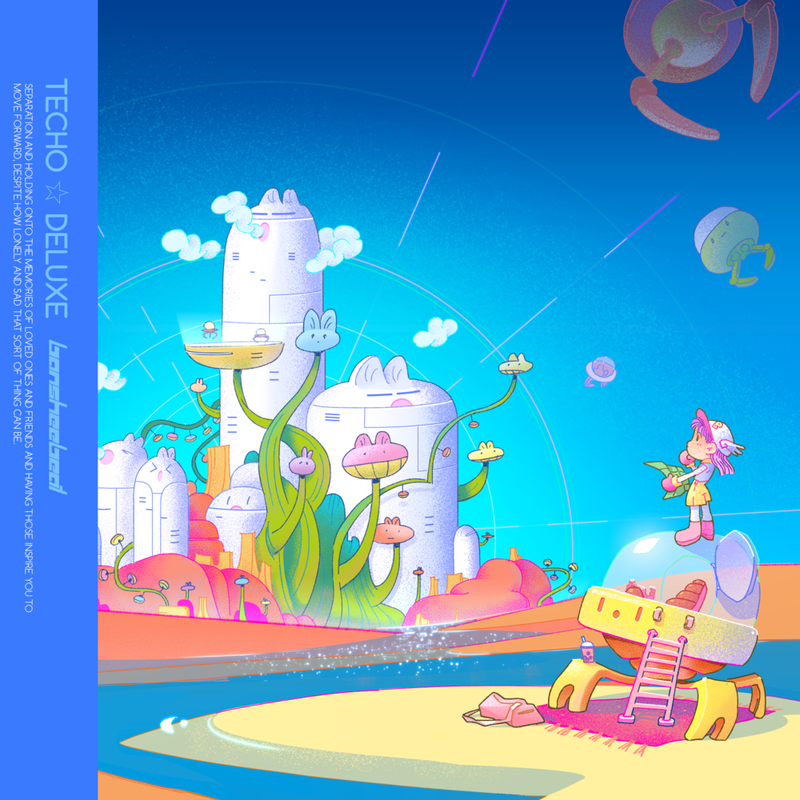 First of all, some major announcements: My new EP, "Techo Deluxe," has finally been announced and will drop on Monday, March 27th, via Attack the Music! To go along with that, a few of the things I’ve been teasing are coming to light, and I’m very excited to share them with you! So, let’s get started and see everything I’ve been scrambling to prepare for next week! Last week, I finally debuted the teaser trailer I’d hinted at in previous updates, and I’m happy to be able to share the finished product! Collaborating with my friend Pixelon, the finalized version came out better than I could have anticipated! The animations came out incredibly fluid, and I’m incredibly hyped every time I rewatch it! In a bit of a surprise, the trailer was met with incredible excitement from my friends and listeners; the trailer received a huge amount of response on social media! I was astounded at the reaction, and it only made me more impatient over the countdown to the actual release. Another thing I was incredibly excited to finally share aside from the music itself was the fully rendered album artwork! I was fortunate enough to work with the incredibly talented visual artist Jean Liang, who delivered some of the most stunning art pieces I’ve ever seen! Using character designs I’d previously created alongside my friend Audrey from Cute Hospital, Jean painted a magnificent visual companion to the record. We started working together in around September, and we capped on the final versions less than a month ago! It was an absolute treat working with Jean, and I’m floored by how unbelievably gorgeous the final product ended up being. The next thing on my terribly unorganized PR train was a track premiere with my friends over at Melting of Age, an LA music and lifestyle blog focused around independent electronic music. They were kind enough to debut my brand new track, “Seems 2 Be,” and give it a neat little write up! You can check out the article here, or listen to the track below! To help kick off the release on Monday, the prior Saturday I’m throwing a little online radio show / release party! I was fortunate enough to set something up with Japan-based Internet radio network Datafruits.fm to host an incredibly cool lineup of some of my favorite people, including frequent collaborator Slime Girls, Cool Teens, Yoshino Yoshikawa, and more! It starts at 6:00PM PST and you can listen live @ datafruits.fm on Saturday night! The last thing on my to-do list before I could announce the new EP was to finalize the press kit that I’d discussed briefly in previous updates. While I’ve usually just done press contact stuff through brief introductory emails to various publications and outlets, it’s really satisfying to actually have a professional looking press kit that I can share on its own. It’s an all-in-one resource for information on what I do, the release (as well as the album artwork and track list), and a brief descriptive overview on the individual tracks themselves. Neither visual design or writing about my music is terribly easy for me, but I'm really happy with how the final product came out! While I’m still working to figure out how to effectively promote the release to the best of my ability, my friends over at Attack the Music have been really helping me out! We are currently in talks to share the album with Japanese fashion outlet Galaxxxy, who are looking to include the album in the music rotations in their stores. In addition, we’re currently working to have the tracks played out by various DJs associated with the label, including Japanese powerhouse Taku Takahashi! I’ve worked incredibly hard over the last six months to do everything I can to promote the album as effectively as possible to help promote my recognition and my vision, so that I can continue to move onto bigger projects and opportunities. Thank you so much for joining me again as we go through this process together, and I hope you look forward to hearing the full release on Monday, March 27th. Week 4 Review + Announcement Prep! We are now onto week four of this nine-week bansheebeat project! If you’re just now coming onboard, this project acts as a means for me to stay organized and focused this spring, working toward preparing, releasing, and promoting my new album! Being nearly half way through the project, a lot of things that have been incubating are very close to being realized! The official announcement of my new release, along with all of the details I’ve been withholding here with my updates, will be secret no longer! Most of this past week has been working to prepare all of the materials necessary for the full announcement, and while that might just sound as simple as saying “hey I have a thing coming out soon,” there was actually a lot more to it that I wasn’t expecting. While a few of these are still in progress (I’m aiming to have everything submitted to the record label in charge of the release by this weekend), I will still go through my process in preparing these materials for the release. Although I’m trying to avoid sharing the artwork in full before the EP is announced, I will share the mobile wallpaper version that will come with the full release once it drops. Here you can get just enough of a teaser of the front album artwork until I unveil it with the announcement. My friend Pixelon and I are still pushing to wrap up the announcement trailer, but I can share a bit of our process thus far. Unfortunately, I don’t currently have access to an exported copy of any of our drafts, as my computer cannot process video terribly well and thus left all of the hands-on work to him. The concept we’ve gone for is to introduce a snippet of a couple of the songs set to an animated rendition of the album artwork! This was our second idea, as our first thought was to combine segments of all of the tracks into a collage for the trailer, but we eventually settled on using only two of them to neatly accompany the two separate art pieces featured in the video. Pixelon is a video wizard when it comes to editing and doing really neat things with text and imagery in a video context. We’re rapidly working to finish the final draft, and will release it along with the announcement! This has been incredibly difficult for me to come up with. Now that the album, artwork, and everything else is complete, coming up with the words to really send it off into the world have been difficult for me to manifest. The album was drafted, arranged, and produced from November of 2015 through roughly September of last year, and after that I’ve spent that time up until now doing other post-production and pre-release work. I have so many different things I could say about what this release means to me. Do I discuss how I felt about it during the writing process, how I feel about it now, or what I want to impart on the listener as a companion to listening to it? Nailing what I want to say has been a struggle, not made any easier by the fact that I find it incredibly difficult to convey my thoughts through text. In addition, so many different people had individual impacts on the release, whether in the drafting process, production, or in post, so coming up with a concrete “thank you” list has been impossible. I have too many people that I feel were essential in some way or another for making this record possible, so I really want to genuinely thank everyone who participated in helping me bring this to life. As per the advice given to me from multiple friends and colleagues, for the first time in my life I’m drafting up a full blown press release to use when promoting the EP. I’m the furthest thing from a journalist, and writing anything involving words is honestly not my strong suit. Luckily, I’ve been reading enough music publications over the last several years to have enough of a grasp on the overblown descriptive language and hyperbole that is incredibly common in this field. Also, my friend Lachlan Johnston, who is a music journalist that writes for the Japanese division of the New York Times, sent me a few press releases he’s both received and written himself to use as a reference. While the write-up is still far from perfect, and that I need to convert it from pure text into a multimedia document, is well on its way to being a sufficient piece of media promotion. Describing my music in a regular conversation is already very difficult for me, so to explain everything that definitively informs the reader on exactly what this release is sonically and thematically was extremely hard! But, after a lot of time spent pulling for astute descriptions, and feedback from various music journalism colleagues of mine, I think I was able to come up with something acceptable! Above I've include a screenshot of my current draft, and to the left is a look at how it will might appear once I include everything else in the document. I’m still scrambling to have everything ready to go by the end of the week, but I’m very satisfied with all I was able to accomplish thus far! This project has seen me doing things I’d never even considered doing with a release, such as the press release. I’m very excited to share the final announcement I’ve been working toward for the past several weeks, but after that I will have an entirely new list of things to work on up to and following the day when the release is finally here! Thank you again for joining me in this undertaking! It’s been an incredibly insightful process and I’m very glad I can share this experience with you all! It’s now that time where we check in with how the bansheebeat Spring Project is coming along. If you’re just now joining us, this is a massive eight week project that aims to coordinate, promote, and organize my new EP release, with the goal of amplifying audience outreach and curating supplementary content and events to support it. With this being the third week, most of the work I’ve accomplished has been in the realm of outlining and scheduling various larger projects that will take shape as we progress along, but there are a few exciting things to report at this stage in the timeline! While I’m still a short ways from finally announcing the EP in full, I’m working toward finishing all of the material for the reveal. I am currently finalizing details with the yet-to-be-announced label in charge of the release. I’m happy to say we have an effective timeline for releasing and promoting the album all set up, and that I’m pushing to finish all of the exciting promotional material very soon. Currently, I’m working on a teaser trailer with Los Angeles graphic design artist Pixelon. After spending most of last weekend drafting and trading ideas, we’re finally getting into the production stages so look forward to some cool updates on that next week! I’m very glad to announce that I will be hosting an EP release party on April 1st at Pomoro in Tucson, AZ! I’m working on finalizing the lineup, so once everything is organized I will release a promotional flier for the event. Pomoro is one of my favorite up-and-coming independent art spaces / venues so I’m very pleased that I was able to secure it for this particular show! The venue does not currently have a web presence, so here is a map of its address. This past weekend, I had the pleasure of laying down some drum tracks for a new project at Tucson’s WaveLab recording studio! It’s always a blast getting back into the studio. After some time away from my beloved drum kit, it was really refreshing to reconnect in a professional recording environment! I also treated myself and brought a few of my supplementary toms and cymbals out of storage, so I absolutely spoiled myself getting those puppies on tape! In other news, I have a special announcement for you remix lovers out there! I have just been asked to appear on Chicago producer VenoSci’s new KEYCHAINS remix compilation! I’m slated to appear alongside some of my favorite artists, including Hair Kid from Japan as well as Matra Magic and SOTUI! All proceeds from the release are going directly to the ACLU, so please look forward to hearing some great tunes that will help benefit a great cause! I am ecstatic to finally announce that I’m finalizing the beginning stages of producing a music video! I’ve been keeping it super under wraps until now, but everything is finally in order and filming is slated to start in the next few weeks! I have an awesome crew assembled featuring photography and art powerhouse Sean Li Wong and camera wizard Thomas Inthout, who I’ve collaborated with on several projects in the past! As production continues I will be going very in depth into the filming and editing process. I’ve never worked on anything remotely similar to this so I’m looking forward to sharing my experiences making a music video and trying my hardest not to constantly mess it up! This was a really solid week of progression! That said, I wish I had considered the lack of multimedia content that would have come out of the initial first few weeks of this project and thusly compensated for that in my initial outline. However, I will focus on integrating that more into the future of this project so that every weekly update retains a balanced ratio of news and updates, new content, and personal insight and reflections. Hi, everyone! Today marks the beginning of a brand new eight-week personal project for bansheebeat. I've been making and releasing music under this project for nearly six years, and in that time I've had so many opportunities to meet amazing new people, perform around the southwest, and discover new ways to change lives through music. I am now incredibly excited to take the next big step in my career by reaching out to new locales, new audiences, and to spread my sound to a greater part of the world. Because you have all been my dependable listeners and supporters, I wanted to reach out to you in a new way, too, and invite you to go through the process along with me! Some of you might be aspiring songwriters, producers, and musicians yourself. One of my goals is to share this journey with you so that you might step up and accomplish bigger things, too, when ready! I want this to be a real look at the life of an independent musician! “So what is this personal project?” you might ask. It is comprised of eight weeks of individual weekly goals and activities, each dedicated to furthering my skills as well as visibility in a variety of ways. Among those features, there will be more exciting details unveiled in later updates, so stay tuned! So, in starting out, I had a few specific goals for this week. On top of kicking the project off, I had to take the necessary steps to ready myself for the next several weeks. The first on the list was obtaining photo and video editing software. While I have been using various software and sound engines to produce music for the better part of ten years, I have absolutely no idea what to do when it comes to creating visual content, both static and video based. Fortunately, I have so many talented friends who are artists or film directors who have been kind enough to curate supplementary content for my material (album artwork, promotional videos, live visuals, etc.). However, I need to become more independent so that I can rely on myself more to accomplish these tasks, so I purchased two editing programs, Adobe Photoshop and Adobe Premiere. While I’ve read and watched various learning materials and tutorials for these programs, using them on your own is an entirely different and slightly scary undertaking. For Valentine’s Day, I published an hour-long holiday themed music mix. Studio mixing (and live mixing in general) is honestly not my expertise by any stretch, so coming up with an hour of nearly seamlessly transitioning material was a challenge as well. Luckily, a few of my talented DJ friends offered feedback and criticism to help me smoothen out the product as best as possible. It was honestly a lot of fun, but ended up being more taxing and time consuming than I had ever anticipated! I also decided to create unique artwork to go along with the mix on Soundcloud, so I popped open Photoshop and got to work! Starting out, my dear friend Mari Ralis, a freelance artist from Portland, OR, was kind enough to supply me with an art sketch to base the artwork around. Taking that, I tried various methods of digital painting, color editing, typography, among other things over the course of two evenings. By the end of the first night, I ended up with this result. While a step up from the blank nature of the original sketch, the colors weren’t blending together in a way I felt satisfied with, and was overall visibly composed by the crude hand of an amateur. While several days of Photoshop tutorials have definitely made me more comfortable with the software, I was still nowhere near apt enough to make anything near a borderline professional standard. Out of ideas, I contacted my friend Calvin, of the SpaceMoneyOctagon podcast network, who has been proficient with photo and video editing for years. They helped me take what I had, tweak it, and transform it into a much better product. While I have been dabbling with video tutorials for Adobe Premiere, I didn’t have too many opportunities to try my own hand at it. I was able to take short video recordings made in a practice room at the University, but I did not have ample time to edit the footage before running into space and RAM issues with my computer. I’m continuing to figure out how to work with video content around the constraints of my older laptop model by cleaning out and organizing storage as well as prioritizing memory usage. This week was an imperfect start in launching the project, but if anything that just prepares me to be ready for anything and everything to present new challenges! Taking on new opportunities can be daunting and stressful, but I’m super excited at the things I’ll learn and experience in the coming weeks! Thank you for joining me on this new journey, and I hope you’ll accompany me through the next several weeks as I unveil new and exciting announcements and work toward personal and professional improvement!